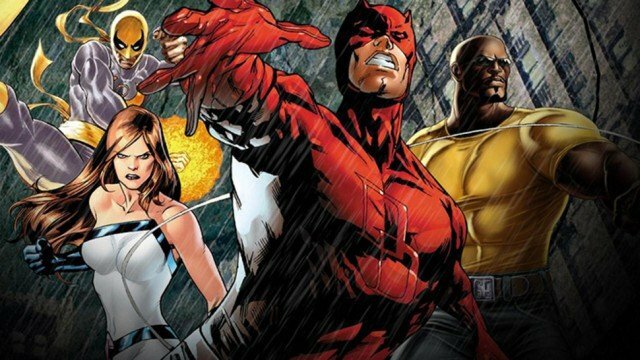 Due to enter production towards the tail-end of 2016, Marvel is already assembling its chess pieces for The Defenders, the small screen ensemble series that will signal the coming together of Iron Fist, Jessica Jones, Luke Cage and Daredevil. Overseeing that hotly-anticipated team feature will be Douglas Petrie and Marco Ramirez, who already know a thing or two about Hell’s Kitchen and its eccentric inhabitants. Outside of work on Buffy the Vampire Slayer and Orange is the New Black, both Petrie and Ramirez worked as showrunners on Marvel’s standalone Daredevil series, and today’s news ensures that their tenure in the studio’s ever-expanding universe will continue long into 2017. Adding to this, Executive Producer and Head of Marvel Television Jeph Loeb spoke about the work going into creating a crack team of writers for The Defenders – one which will also include the esteemed Drew Goddard. Bringing together Krysten Ritter (Jessica Jones), Mike Colter (Luke Cage), Finn Jones (Iron Fist) and Charlie Cox’s Daredevil as the de facto team leader, Marvel’s The Defenders is expected to premiere at some stage in late 2017. Before that, we have the arrival of Luke Cage in September, along with a sophomore season of Jessica Jones and Finn Jones’ debut as Iron Fist early next year. Buckle up, Netflix subscribers, we’re in for quite the ride.